KENNEDY SPACE CENTER, FL--Launch of an Atlas 5 rocket carrying a pair of NASA science satellites bound for the Van Allen radiation belts was called off early Saturday because of nearby thunderstorms and cloud cover, the second delay in as many days for the $686 million Radiation Belt Storm Probes mission. After initially ordering another 24-hour recycle for a third launch try Sunday, mission managers re-evaluated the weather and expected storms associated with Tropical Storm Isaac and decided to roll the 189-foot-tall rocket and its twin-satellite payload back to the protection of its processing building. "With the unfavorable weather forecast as a result of Tropical Storm Isaac, the leadership team has decided to roll the Atlas V vehicle back to the Vertical Integration Facility to ensure the launch vehicle and twin RBSP spacecraft are secured and protected from inclement weather," NASA said in a statement. "Pending (Air Force Eastern Range) approval … the launch is rescheduled to Thursday, Aug. 30 at 4:05 a.m. EDT." The Radiation Belt Storm Probes mission is the most ambitious attempt ever mounted to study the structure and composition of the Van Allen radiation belts, how they are affected by charged particles blasted away from the sun and the threat the belts post to astronauts and costly spacecraft. The identical 1,400-pound RBSP satellites, built by the Johns Hopkins University Applied Physics Laboratory, will operate in slightly different orbits, flying through the radiation belts for two years to better understand their impact on Earth's space weather. A launch attempt Friday was scrubbed because of questions about a C-band transponder on the United Launch Alliance Atlas 5 rocket that is used for tracking during the climb to space. After reviewing telemetry, mission managers decided the transponder could be launched as is and no repairs were necessary. 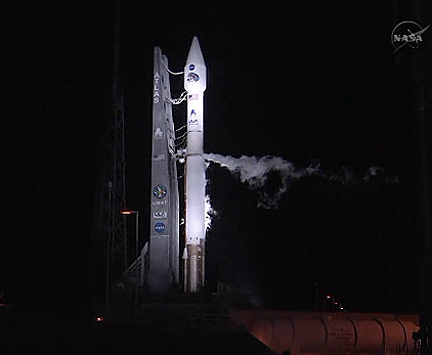 With forecasters predicting a 60 percent chance of good weather, the team set up for a second attempt Saturday at 4:07 a.m., the opening of a 20-minute launch window. But as it turned out, nature did not cooperate and meteorologists were unable to give a "go" to proceed before the window expired. The rocket now will be rolled back to the Vertical Integration Facility Sunday.